Hi guys! Today I have a cute little box to share with you! 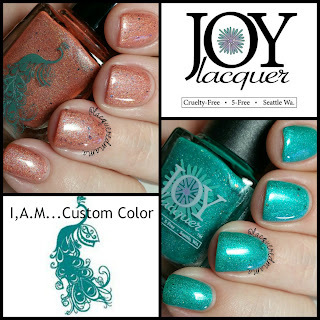 The Friendship is Golden Duo is brought to you by Joy of Joy Lacquer and Ashlie of I,A.M...Custom Color! They got to meet at an Indie event awhile back and have become really great friends, so they wanted to create something that celebrated that! "Ashlie and I officially met for the first time in Vegas during the Cosmo Prof weekend at The Cocktails and Colors Event. We totally hit it off because she is awesome and it's impossible not to love amazing people such as her. We shared a table at the event and loved how our purple/teal logo colors ended up making the display flow really well. The next day we both showed up wearing identical bright coral colored shirts and got a kick out of that too (simple minds, I know). We dubbed these (teal and coral) to be our signature colors. 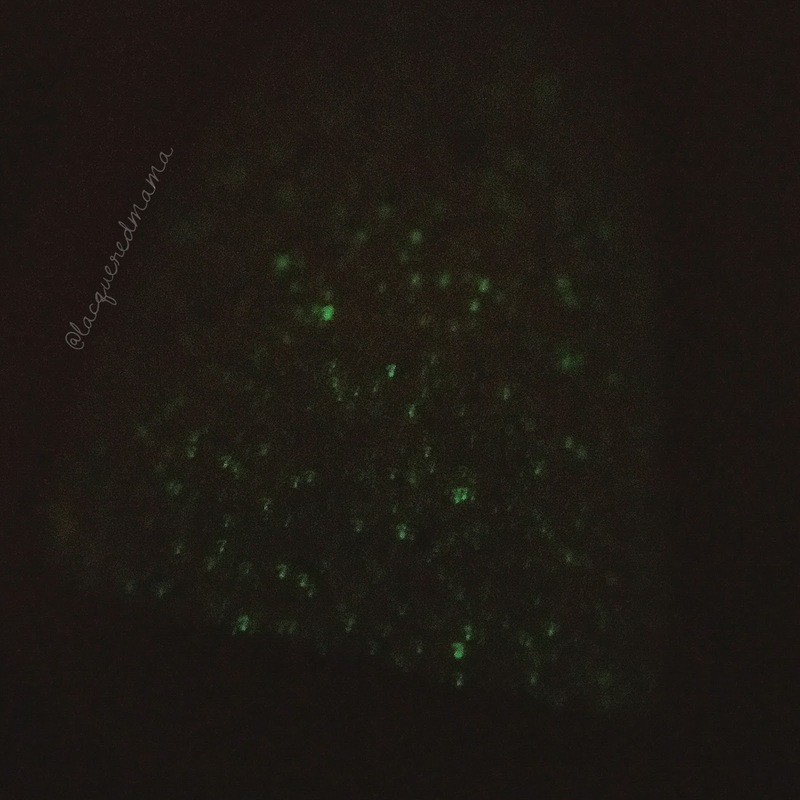 When we discussed doing a polish collab, the goal was to make these two colors complement each other, in an opposing way. This is kind of difficult without making coral and teal mud together, but I think we pulled it off! We originally wanted to correlate the names with "The Golden Rule" because it's an important lesson to follow in making new friendships. Also, in Vegas, all that glitters is gold! In the end, the polish names combined is "Friendship is Golden" which is our pet name for this duo. " Life's Golden Lesson is a gorgeous, deep turquoise holo with a purple/turquoise shimmery shift and scattered coral & copper chrome flakies. This had a wonderful formula that was opaque for me in two thin coats plus topcoat! For my half of the duo, I created my coral polish as a deeper, fall version of “Tahiti Sauce." This was the Vegas exclusive I brought to Cocktails & Colors and it was such a hit. It was a funny surprise the next morning when I walked in and saw Joy’s outfit, I died. We couldn't have planned twin outfits better, in matching Jean Shorts and those Coral Tops! But of course we didn’t plan it at all. In that moment, I looked at her knew what I wanted to do for our Vegas commemoration duo. Lets just say, everyone on the airport shuttle thought we were nuts with identical outfits! To Twinning and the best taste in colors! As a small business taking risks is very scary and going to a trade show event like “Cocktails and Colors” was a huge risk and came with a huge reward. When Joy initially signed up, we had just met through FB and barely knew each other. She came to me with the idea of sharing a table with her in Vegas in just a few short weeks! I took a chance, said yes and bought a plane ticket! She later told me "I asked you to join me because if it were the other way around, and I hadn't heard about the event, I would definitely want the opportunity to go! And I hope that somebody I knew would have invited me too.” So for me, it's The Golden Rule and that started our "Friendship that Glows Together." In Vegas, we learned about "Life's Golden Lesson" which to us became sort of like "Hakuna Matata". You just have to follow your heart, trust yourself and go with the flow. 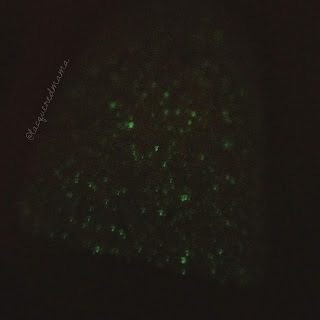 The Friendship that Glows Together is a beautiful deep coral orange with tons of turquoise shimmers and UCC flakies that also glows in the dark! Another super smooth formula that was also opaque in two coats plus topcoat! I love this duo and knew I had to do a mani using both of them! Turquoise and Coral look stunning together! I love this duo to much! Not only because the polishes themselves are really great, but because of the love and friendship I've witnessed within he Indie community as well! The duo includes a mini Joy Lacquer coffee exfoliation bar and an I,A.M...Custom Color mini Wassail Spice Mani Fizz. 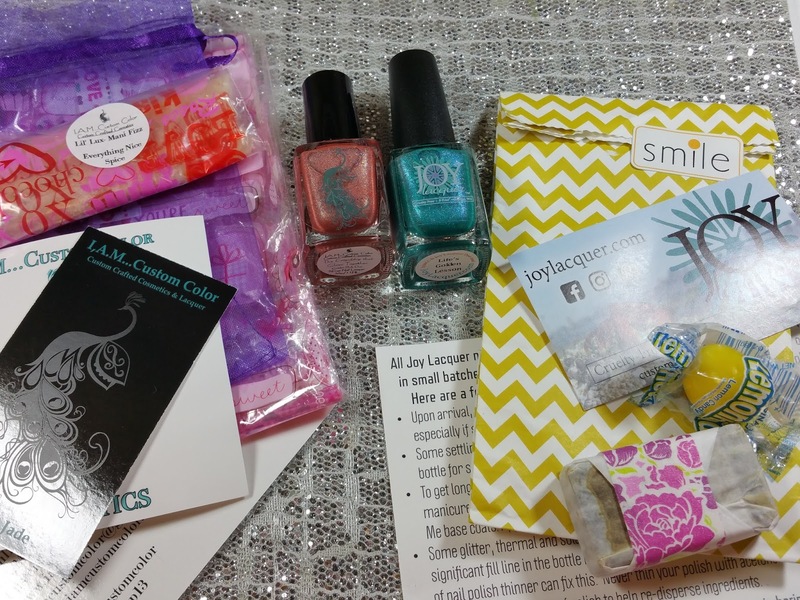 The polishes are both full size 13mL and the package will include a fun sticker and pen! The Friendship is Golden Duo will be available in both maker's shops on September 27th! 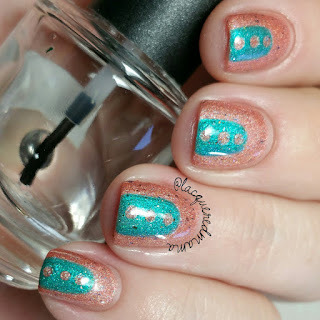 I really dig that nail art. These are beautiful and it is so lovely that both makers hit it off! 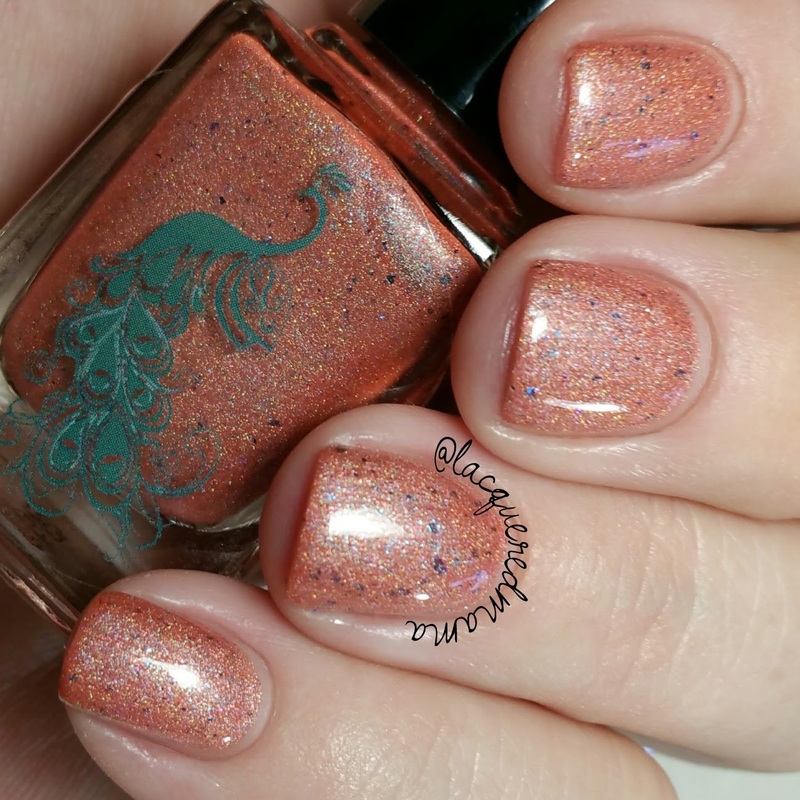 The story behind these two polishes is adorable. And teal and coral are some of my favvvvvorite polish colors. You're definitely tempting me with these!!! I love Life's Golden lesson!